In 2006, I visited a friend in France on the occasion of his 50th birthday. His girlfriend had purchased a painting from a friend in the states and I recklessly volunteered to hand delivery the gift. Much merriment on a short, extravagant trip ensued. 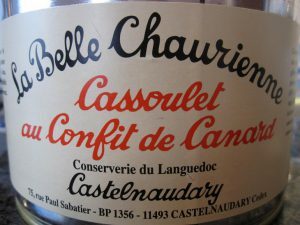 I had been to France several times by then so the merriment included a souvenir shopping spree at the local supermarket in _____: wine, pate, chocolate and of course, our beloved cassoulet. Only the best for my girl. But after I paid for the items, I reached down under the checkout counter to get a plastic bag for my prizes and… there weren’t any. Did I mention it was 2006? As the article also documents, the rise of plastic bag bans in localities across the country has led to an commensurate rise in bans on plastic bags bans. Pre-emptive war against positive environmental trends and we are [still] so terribly petty and stupid. But good for California and its beaches. Reminds me of love notes, ibuprofen and white vinegar: stuff that actually works!